Different workloads demand different attributes from their storage. These differences lead some to believe flash storage is only good for certain point use cases like accelerating databases. But the performance of flash systems lead others to claim a single flash system can support all workloads. The truth, as usual, is somewhere in the middle. 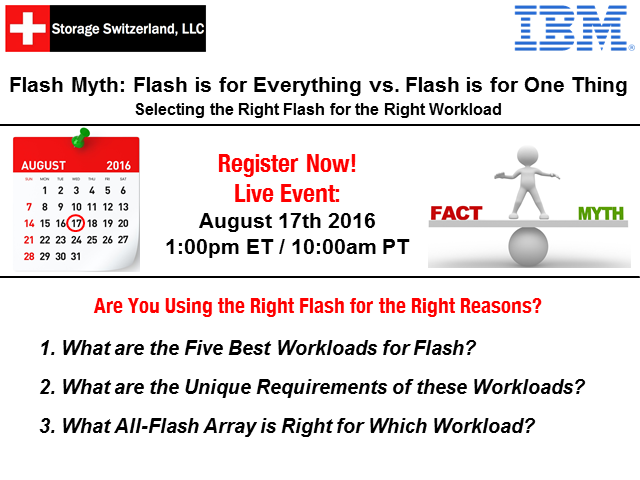 Join Storage Switzerland and IBM for this live interactive webinar where we bust another flash myth and help you select the right flash for the right workload for the right reasons.